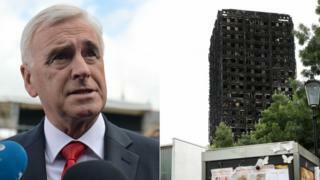 Labour's John McDonnell has claimed victims of the Grenfell Tower fire were "murdered" by "political decisions". Speaking at Glastonbury Festival on Sunday, the shadow chancellor blamed the decision to "view housing as only for financial speculation". At least 79 people are feared to have died in the fire in west London, which began in the early hours of 14 June. Housing minister Alok Sharma said it was "disappointing" that people wanted to make it "a party political issue". It is thought the building's recently-installed cladding may have helped the fire to spread. The type of insulation material used on the tower is also being investigated, along with suggestions that the way the insulation and cladding was installed could have created a chimney effect. Cladding from as many as 600 tower blocks across England is now being tested for safety. So far, cladding on 60 high-rise buildings in 25 areas has failed, and none has passed. One of the blocks which failed was Elizabeth House in Wembley - to the "surprise" of the building's management company. Noel Brosnan, a company director at Octavia Housing, said: "This building was constructed in 2013 and at that time we got the assurances that it met and complied with building regulations and it has been signed off by the local authority. "So of course we were quite surprised and dismayed to hear that this building did not meet building regulations." The prime minister ordered a public inquiry on 15 June and is due to chair a meeting of the Grenfell Tower Recovery Taskforce on Monday. Insulation and cladding taken from Grenfell Tower failed preliminary safety tests last week. Mr McDonnell, the MP for Hayes and Harlington, was speaking in a panel debate at Glastonbury's Left Field event, chaired by Guardian journalist John Harris. He said: "Is democracy working? It didn't work if you were a family living on the 20th floor of Grenfell Tower. "Those families, those individuals - 79 so far and there will be more - were murdered by political decisions that were taken over recent decades. "The decision not to build homes and to view housing as only for financial speculation rather than for meeting a basic human need made by politicians over decades murdered those families. "The decision to close fire stations and to cut 10,000 fire fighters and then to freeze their pay for over a decade contributed to those deaths inevitably, and they were political decisions." A source close to Mr McDonnell confirmed the quotes were accurate. Jim Fitzpatrick, who chairs the all-party parliamentary group on fire safety, said his Labour colleague's comments were inappropriate. "Jumping to conclusions and pointing a finger of blame at this point, I think, is somewhat premature," he added. Mr Sharma, who replaced Gavin Barwell as the housing minister following the general election, said the cladding in question had been installed over a wide time period and under councils controlled by different political parties. Pressed on a timescale to complete the testing, he said the government was working "round the clock" to get the work done. There is the capacity carry out 100 tests a day, he said, but samples need to be sent in as quickly as possible. He said: "Some councils are acting very quickly and we want all of them to be acting urgently on this." Mr Sharma also said the government would "offer support" to councils, although he wouldn't put an exact figure on financial aid. Over the weekend, Camden Council evacuated 650 people from four tower blocks in Swiss Cottage area, after London Fire Brigade raised concerns about cladding, gas pipe insulation, and fire doors. The four blocks were renovated by Rydon between 2006 and 2009 - the same company which oversaw the refurbishment of Grenfell Tower from 2015 to 2016. Five high-rise buildings in Sunderland had cladding removed as a precautionary measure to "reassure residents". Buildings have been also declared unsafe in Doncaster, Norwich, Stockton-on-Tees, Manchester, Plymouth and Portsmouth. In Scotland, Holyrood is going to hold its own investigation into the safety of tower blocks, expanding an ongoing inquiry into housing and building regulations. The Scottish Government has already said that no council or housing association high-rise block has cladding of the type believed to have been used in Grenfell Tower.